I guess it is valid to say that this post is a follow-up to one of my most recent posts called "Keeping an Observing Log". Recently, I was searching for some good RSS Feed content for our Insight Observatory's blog and stumbled upon a website that is similar to NASA's Astronomy Picture of the Day website. The difference is that it's entitled "Astronomy Sketch of the Day" and features astronomical sketches of astronomical objects or phenomena observed in detail submitted by amateur astronomers around the globe. Lunar Crater Gassendl Sketched by Achim Rohe. 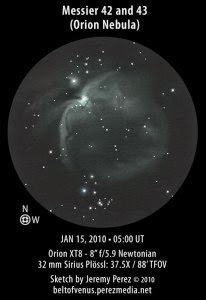 As I may have mentioned before in one of my previous posts, the art of astronomical imaging today allows observers to acquire fine detail of astronomical objects with minimal effort thanks to remote telescopes that are accessible via the internet. However, there is much to be said about sitting at the eyepiece of a telescope and taking the time to sketch out the detail of an astronomical object. This process forces the observer to perhaps see more detail due to the time it takes to get a good representation of the object on paper. As I mentioned in my previous post, the method I used for drawing the planets, galaxies and nebulae observed through my 4.25" and 6" reflecting telescopes I used to own was using colored or graphite pencils on plain sketch paper. One method that was also popular years ago was using white chalk on black construction paper. However, I never got around to trying that method. After browsing through the astronomical sketches created by observers on the website "Astronomy Sketch of the Day", I have been exposed to a contemporary and interesting way of recording visual observations at the eyepiece of the telescope. 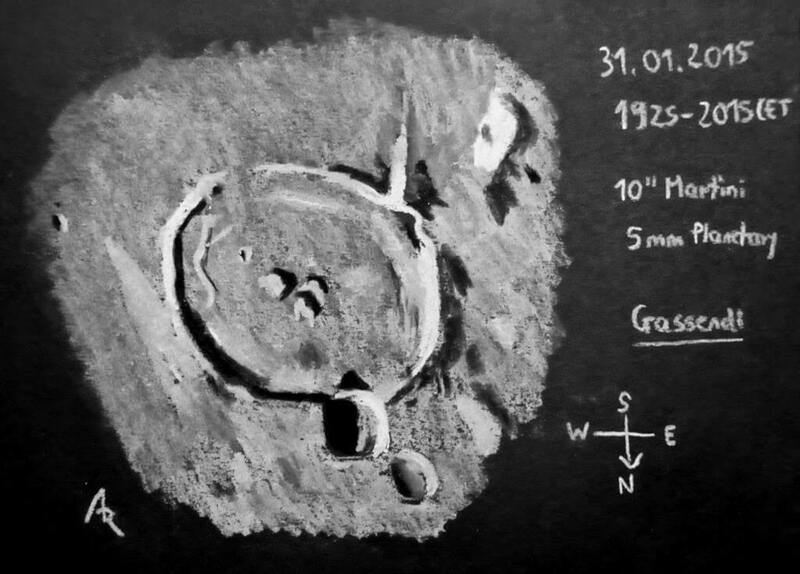 It seems the most popular method of astronomical sketching today is utilizing graphite and watercolor pencils on white sketch paper, then scanning the drawing on a personal computer, proceeded by saving the image with reversed values in an imaging program such as Adobe Photoshop. I have included a few examples on this post. There are many tutorials on various methods of sketching astronomical objects on the internet as well as the book I found entitled "Astronomical Sketching: A Step-by-Step introduction (The Patrick Moore Practical Astronomy Series). Not only is astronomical sketching a good way to learn detailed characteristics of astronomical objects in the world of astronomy education, but it is also a great exercise for enhancing one's artistic skills. However, please keep in mind, it may take patience.